Purpose built as a tender for a Royal Naval warship, this Cheverton 24 is strong, stable and seaworthy. Recently converted for use as a MFV, the owner has had the cabin extended to provide a roomy and practical wheelhouse. It has good headroom (one of the shipwrights working on it was 6’1”), good visibility all around and gives good protection from the elements. There's a comfortable helm seat, sun roof and plenty of storage under the cabin sole to keep your beers or other beverages cool. You can enjoy your trip out to and back from your favourite anchorage or fishing ground rain or shine. Well engineered with heavy GRP, the hull form offers full protection for the prop so she can take the ground safely and there’s plenty of room on the aft deck for sunbathing or fishing. Solid, stable and with a sense of history, I think this vessel could provide plenty of pleasure on the water. 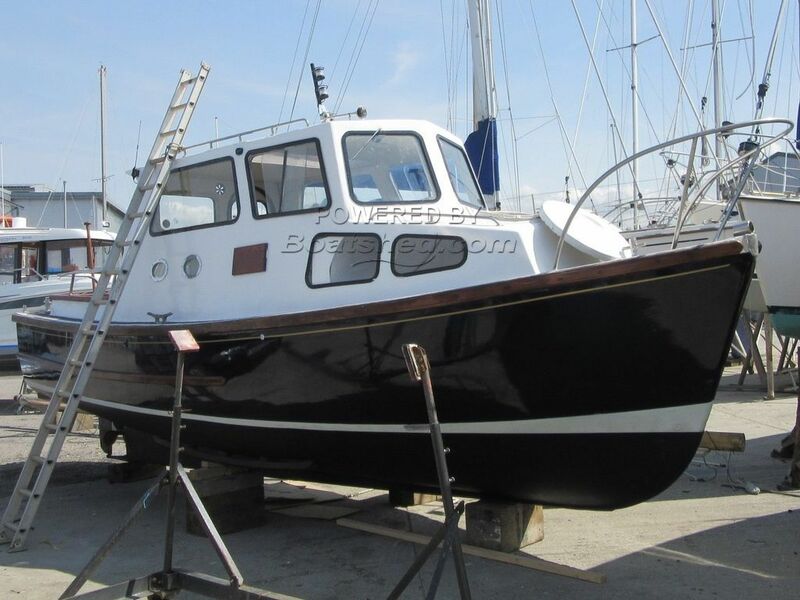 This Cheverton 24 has been personally photographed and viewed by Billy & Jo Hallam of Boatshed Plymouth. Click here for contact details.